This UAE National Day, celebrate by booking a getaway with Etihad Airways National Day deals. Book flights from Abu Dhabi to exotic destinations across the globe such as Kuala Lumpur, Singapore, Brussels, London, Amsterdam, Dublin, Milan and Seychelles. Book before 24th November 2018 for travel up to 31 July 2019. Fares displayed are inclusive of surcharges and taxes but weekend surcharges may be applicable. From serene beaches to thrilling theme parks to the adventurous desert safaris to the timeless Louvre to the Arabian wildlife, Abu Dhabi is the perfect summer destination. Experience the rich Emirati culture and heritage with this unbeatable Etihad Airways deal! Fly with Etihad Airways and avail a plethora of add on services such are reserving a chauffeur to pick you up to the airport and drop you home after flights, seat upgrades, online check ins, and more! Customers only have to pay a minimum fee to avail the services! Hurry up and travel in comfort and style with Etihad Airways! Verified on 20 Apr 2019. Etihad Airways is offering the amazing discounts on sign up. Sign up now and get 500 Etihad Guest Miles. No Etihad discount coupons required to avail the offer. Book now. Flying to the city of love, then choose Etihad Airways and get prices as low as Rs 35000 from Mumbai. Hurry up and book your flight ticket to your Parisian adventure with the sleekest airline in town, Etihad Airways. Book your Etihad flights using miles to earn a reward ticket and get a free ticket for your companion. The bookings must be done for 2 guests by paying the full fare with Etihad Airways Guest Miles or a combination of miles + cash. Enjoy destination perfect experiences with Etihad Airways Hala Abu Dhabi venture! Live, breathe and revel in the culture of the UAE! Go ahead and book your Abu Dhabi adventure with Etihad Airways today. Enjoy a 20% excess baggage allowance! Hurry up and book your tickets now. Discounts are available up to 48 hours prior to flight departure. All excess baggage payments (fully or partially used) are non-refundable. Discover the best fares at Etihad Airways to our top destinations. Fly To Johannesburg from India fares starting at Rs 37,551 at Etihad Airways. Offers are subject to availability at the time of booking online with Etihad Airways, these are special fares with limited availability. Fares are inclusive of applicable taxes and fuel surcharges. Valid visas and travel documents are the responsibility of our Guests. Flight/Day restriction and Blackout periods may apply. Weekend surcharges may apply. Etihad Airways promo code is not required to avail the best deals. Hurry Up!! Book now. Get the best deal ever fro the flight ticket for Hyderabad - Chicago flight. Etihad is giving the best flight fare for Hyderabad - Chicago Flight. Book now for Rs 101604. No coupon code is required. Book flight tickets and travel and get 25% OFF on extra space (Economy Space). Discount of 15% is applicable on Business Saver fares only. Destinations: Ahmedabad, Amman, Abu Dhabi, Bahrain, Beirut, Bangkok, Bangalore, Brisbane, Mumbai, Cairo, Kozhikode, Jakarta, Colombo, New Delhi, Dammam, Hyderabad, Seoul, Islamabad, Jeddah, Johannesburg, Karachi, Khartoum, Kathmandu, Kuala Lumpur, Kuwait, Lahore, Chennai, Muscat, Medina, Melbourne, Male, Manila, Nairobi, Nagoya, Tokyo, Beijing, Shanghai, Riyadh, Seychelles, Singapore, Sydney, Thiruvananthapuram, Phuket, Kolkata, Hong Kong and Dubai. All travel must be completed by 31 July 2019. If you are in search of the best airlines, then you are in the right place. Etihad makes all your travel goals complete with their amazing airlines and the services they provide. Their goal is to become a global airline by accepting the challenges and to change the way of airline hospitality. It seeks to reflect the Arabian hospitality in its airline services by providing luxury services. For its excellence in its work, it is being awarded “World’s Leading Airline” at the World Travel Awards. Be it a business class or economy class, Etihad airways India always strives to provide the best flight service, that too with amazing offers. Every one of us loves going on vacations. How about international trips with the cost of domestic airlines? Sounds cool right? Then, just go ahead and book your international flight tickets right now. 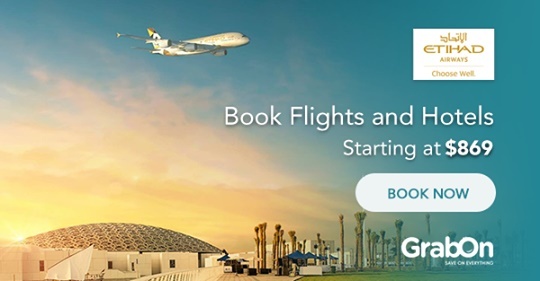 Go for Etihad Airways online booking, they offer the flight tickets at very affordable fares which guaranteed not to burn a hole in your pocket! Etihad India has the most sophisticated fleet loaded comprising of high-performance crafts which are operationally efficient, with extended cabin space and increased flying range. These aircraft have the latest in-flight entertainment systems which give you the finest dining and impeccable service. Want to experience their service? Book a flight ticket and fly around at affordable prices. Avail tickets at amazing prices with Etihad coupons available online. Whether you’re on a personal trip, business trip or a family trip, Etihad air is always ready to serve you at their best. You even get a chance to book last-minute flights at cost affordable prices with GrabOn coupons. You won’t be regretting after taking a trip with Etihad airline. Now, choose your dream destination for vacations and fly to these dream vacation destinations from major Indian cities with Etihad Airways Chennai or Etihad Airways Mumbai. Whether you’re going to Abu Dhabi, Jeddah, Chicago, London or Los Angeles, you can comfortably choose Etihad Bangalore or Hyderabad as your departure point. Apart from visiting these locations, you can also enjoy duty-free shopping with Etihad. Buy the products with a minimum 10 percent discount for a huge range of products. Shop for latest fragrances, cosmetics, jewelry, watches and much more, and get it delivered directly to your seat onboard. They even bring you fabulous vacations to famous destinations. Etihad Airways take care of you from your first step of boarding. It offers first class lounge & spa which delivers superior service and hospitality. You can relax in the Premium Lounge they have. It's Six Senses spa area is dedicated to ambient relaxation, that offers express treatments for the guests. They even bring you deals on the top destination places to visit at cheaper prices. Etihad takes care of all your itinerary and makes it very simple. You can manage your bookings, online web-checking, get status on flights and so on. Other perks include the special 10% discount on Etihad duty free products. Somake the most of yourair journey with this Etihad promotion and shop for some of the best in vogue products from their specially curated catalogue including perfumes, cosmetics, watches, bags, jewellery, etc(Note: the offer is not valid on cigarette and alcohol purchases). Select your products and complete our duty free shopping with Etihad Airways by emailing them your cart products and flight details. Relax and get a transaction confimation within 72 hours (3 working days).Don't forget to browse from the plethora of Etihad Airways offers available on this page. Now, you can enjoy your flight experience in a better way with Etihad. It is known for the affordable fare prices on international flights. You can even save better with Etihad coupons available on GrabOn. Choose your best suitable offers and deals available and roam around. Don’t forget to check out this page for the best Etihad promo code on overseas flight booking. How To Use Etihad Airways Coupons On GrabOn? Etihad, the national airline of the United Arab Emirates is renowned for its luxury first-class suites, award-winning business class and premium economy class. They are committed to work for not just creating sustainability of their business but enhance airport services through innovative approaches and thus persistently broadening their network to over 240 destinations worldwide. Since their inception in 2003 they have expanded tremendously and bagged many awards and titles that echoes their position as one of the leading premium airline carriers worldwide. Today, they are celebrating 10 years of joy bringing millions of voyagers and connecting them to and fro from one place to another.Their services are appreciable and they are dedicated to continue their guest travel class services across various categories, like -- Economy, business, first and the residential class. They take pride in crowning 5 consecutive awards for the “World’s Leading Airline” in the year 2009, 2010, 2011, 2012 and 2013. This symbolizes that Etihad Airline exemplify the best carrier for offering Arabian hospitality, culture and sense of freedom to flight. There are plenty of options to book stopovers and get breaking deals on flights, cars and chauffeur. With this airline, you can now step into the comfortable world without any hassles.